All BT Vision subscribers will be able to access the BBC iPlayer service via their TVs by June says iPlayer product manager Gideon Summerfield. Recently the BBC has released a version of the player for Freeview HD boxes that conform to the D-Book 6.2.1 specification powered by MHEG-5 middleware. 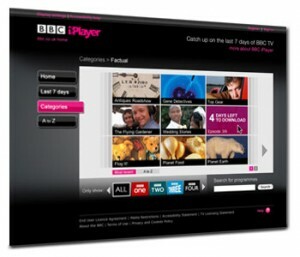 The BBC has also certified the standard HTML version of iPlayer on TV for devices launched by Panasonic and Sony. Summerfield said that support for HTML from these manufacturers, as well as Samsung, LG, and Toshiba, would allow the BBC to build rich applications more easily. He said viewing of iPlayer on connected devices has seen a tenfold increase since June last year, said the BBC.